BE SURE TO SCROLL DOWN FOR ALL THE PHOTOS. 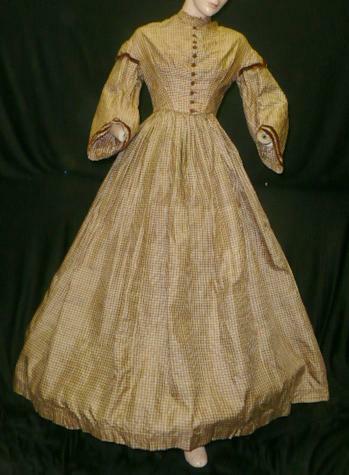 This auction is for a very pretty original early Victorian 1850s to 1860s Civil War era 1 piece dress. Created with lovely shades of brown, tan and black small gingham check print on silk taffeta and trimmed with buttery soft chocolate brown velvet strips. The cotton lined 4 metal styaed typical drop shoulder bodice has a front closure with all matching ribbed silk faille covered small round buttons. 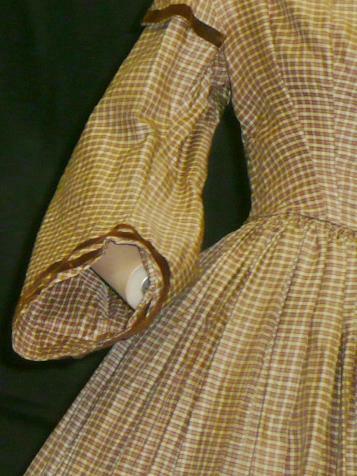 A narrow collarless neckline with piped armycyes and capped long wide similar to pagoda sleeves. 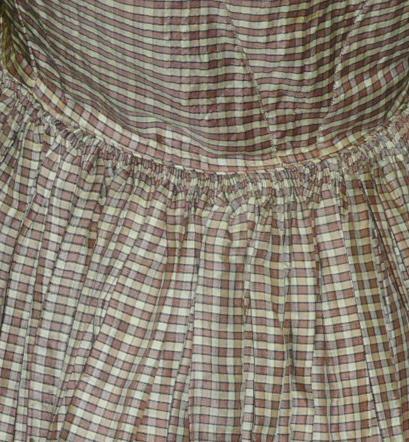 The very full unlinedskirt is photoed w/ a hoop. 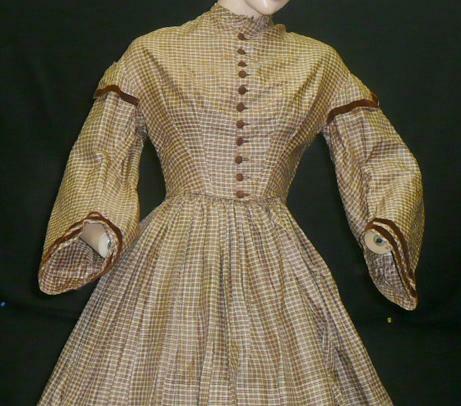 Very tight cartridge pleats surround the waist. A 1.5" hem is lined with narrow light brown wool binding. The bodice appears to possibly have had some minimal alterations most like to be made slightly larger. In overall very good very sound condition. A few pinhole to small holes; there is a small patch on the inside as a repair,yet there is no evidence of the repair on the outside. Machine and hand stitching. There is an inventory name written on the inside of the skirt hem; this dress was originally part of my private collection and I rented it to a film/wardrobe department (True Women starring young Aneglina Jolie and Dana Delaney ; the dress Angelina is wearing on the cover was also mine) for study, I believe it should be laundered or dry cleaned. 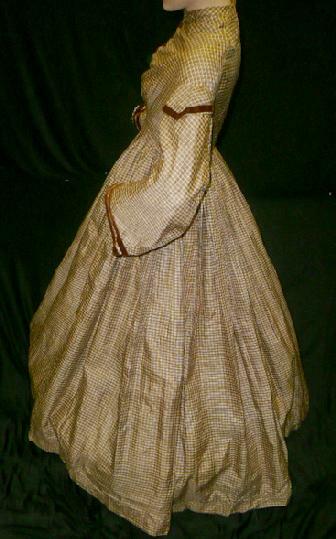 This is a quite stunning dress, especially for display.Approx. Measurements are taken laying flat and closed. Bodice is 33" / 34" bust 23.5" waist, mid shouler to waist is 15", and skirt is 41" waist to hem. You will delight in this piece. bydenise printed on insdie hem. Does anyone else find it ironic that Angelina Jolie is in a movie called "True Women"? Who else is in it? Demi Moore? 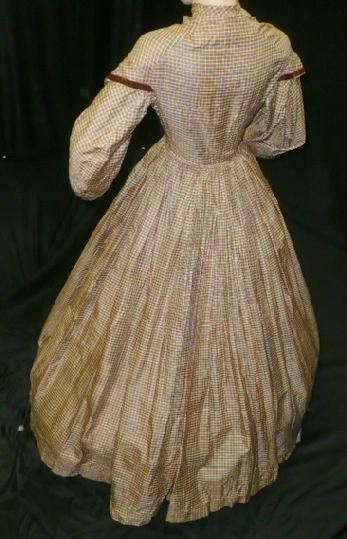 :-D Yes, this is a great example of the early 1860's. 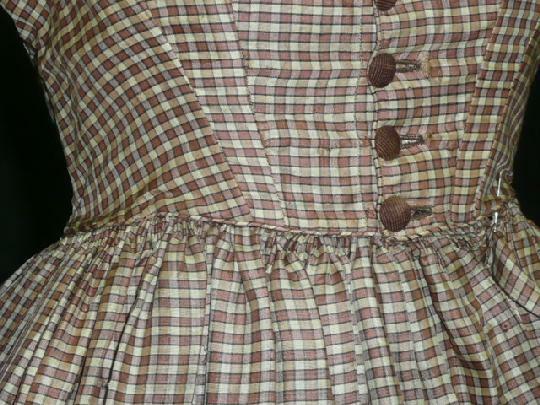 I, personally, like the detail shots so you can see the gathers of the skirt and lines of the bodice more closely.